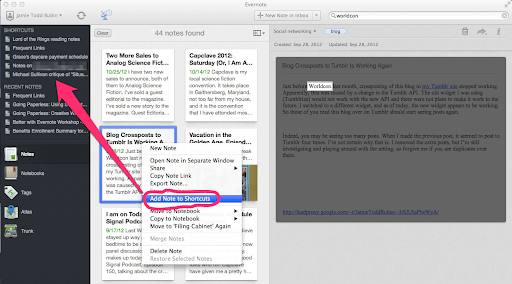 Last month Evernote released version 5 for the Macintosh desktop clients. It was a fairly extensive release packed with all kinds of cool new features. Now that I’ve had some time to use it and get to know it, I’ve got a few tips to share how it can help you go paperless and be more productive. I will admit that one of the most difficult things for me to do when going paperless was give up my need to tack PostIt notes to my monitor to remind me of things, or to help keep track of things that I was working on. Sure, there were Mac OS features that introduced “virtual” stickies, but none of these ever worked for me in a practical sense because they felt too ephemeral. With the introduction of Evernote 5 for the Macintosh, however, I found an answer to my problem. The new “shortcut” feature. Find the note you are looking for. Right-click on the note and select the Add Note to Shortcut option. Lord of the Rings Reading Notes: I am rereading Tolkien’s The Lord of the Rings for the first time in 30 years and I’ve been taking notes as I go along, so it is convenient to have these notes readily accessible. 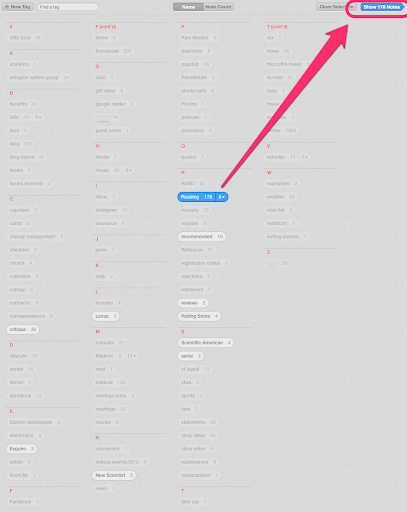 Frequent Links: this is a list of notes to pages or sites that I link to frequently. It’s convenient to pull up this note, copy the link I need, and paste it in my post or email. Faster than having to retype it each time. Daycare payment schedule: the payments vary month-to-month depending on how many days, so it’s convenient to pull this note up to figure out how much has to be paid each month. Note on a nonfiction article I’m working on. I have a mid-month deadline and there was some research involved on this project, so it’s nice to have those notes readily accessible. Critique of a story that I am revising. I’m working on some revisions to a story I submitted to a magazine–the editor requested a few changes and it’s convenient to have notes from critiques of that story from my writers group readily available. And if you want to remove a link from your shortcut, you can simply right-click on the note (or shortcut) and select the Remove from Shortcuts option. 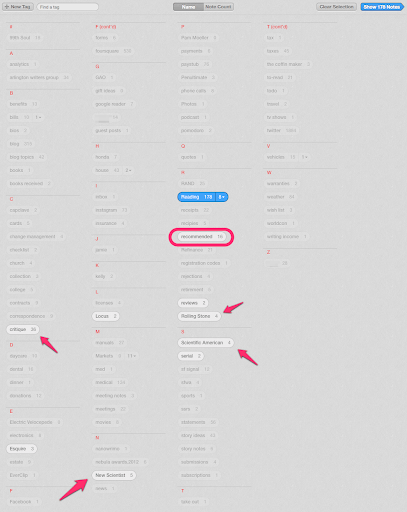 I tend to use tags more for managing lists and for automation. Some people use tags for organization. 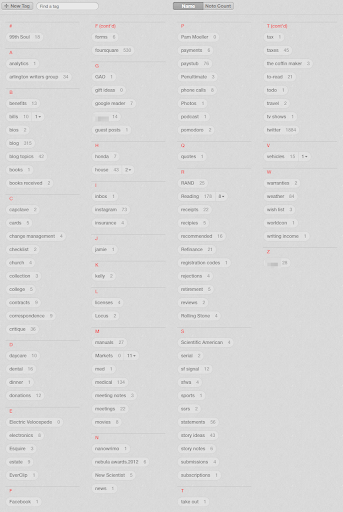 Because of that my list of tags is pretty small. Still from this view, it is easy to produce some quick searches for things that I might be looking for. Suppose for instance I wanted to find all of the items I’ve read that I’d consider recommending to others. I have a “Reading” tag which I use to mark everything I’ve read. I also have a recommended tag which I use to flag those items that I’d recommend. The “recommended” tag can be used for more than just “reading,” however. It might also be used for movies that I watch or music that I listen to. So in order to find just those items that I’ve read and recommend I need to use both tags. 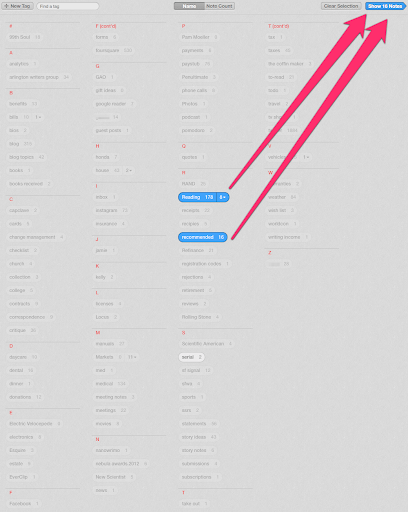 The Tags view makes this very easy. You can see that “recommended” is one of those tags highlighted in white. But there are several others. I’ve only been playing around with Evernote 5 for the Mac for a little while, but these are two of the new features that I use most frequently and that I’ve found have increased my productivity. Plus, I can finally give up those stickies for good. Have you found any useful tips or tricks with Evernote 5? Leave your tips and suggestions in the comments. As always, this post and all of my Going Paperless posts, is also available on Pinterest. Any insight as to when this slick new version will be up for windows and or android? I suspected this question might come up. Alas, I have no special information on this. I’m still using the current Windows version on my own Windows laptop at work. Almost missed this one. I’ve become dependent on reading the posts in the shared notebook, but it isn’t there yet. Speaking of which, are there any plans for the ‘Paperless Lifestyle’ notebook? All it has is the twitter transcript. Thanks, great post as always. Windows has the favourite bar which I use for notes, saved searches, tags, etc. It would be nice to be able to sync these someday. Tyler, I knew I forgot something this morning. I have now clipped the post into the Going Paperless notebook. Sorry for the delay on that. And good suggestion ont the favorites bar for Windows. I thought about that this afternoon. It’s a good suggestion. Helpful tips, thanks. I’ve used the ability to customise the sidebar in EN5 to reduce the number of items shown, and I suspect there will be a tendency to add a load of shortcuts in the first instance, so discipline will be key! 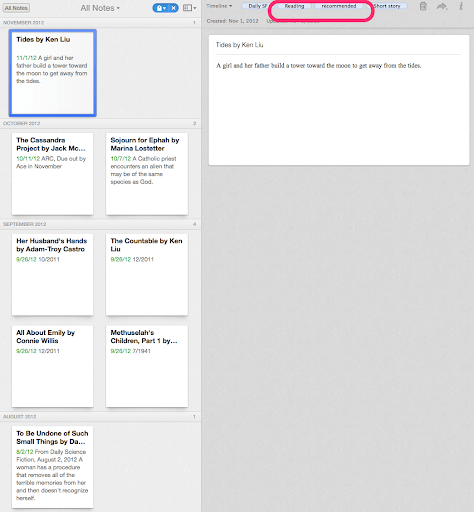 Additionally I think the tags view is the most powerful way to work in Evernote. I posted a quick review of EN5 on my BrainCutlery blog at http://wp.me/p2TvFY-2v – hopefully you and/or your readers may find it useful an addition to the points you make above! can you tell me how to get access to the shared Notebook? I only have the one you set up after the Evernote Paperless Challenge. But that one does only have a single entry. Thanks! 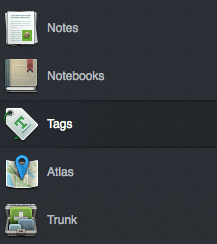 Is there a way to search all the notebooks in a stack with a separate tag? I have a notebook stack that contains 13 distinct notebooks. I’d like to be able to search the entire stack for the tag .next action. I can search notebook by notebook within the stack, but I’d rather not do the search 13 times.